Home » Blog » Gummy Smile? 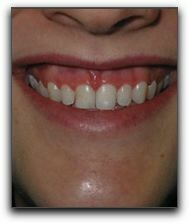 Many Detroit cosmetic dentistry patients with a gummy smile undergo crown lengthening surgery to bring proper balance and symmetry to their smile. Gum tissue and, in some cases, bone is removed to expose more of the visible part of a tooth. It is a safe procedure that does not affect healthy tooth structure. A ‘gummy smile’ is a term used to describe a smile with teeth that appear too short because an unusual amount of bone and soft tissue hide part of the dental crown. Our Detroit cosmetic dental patients who have opted for crown lengthening love how their new perfect smile looks and feels. Some of our Detroit crown lengthening clients also choose teeth whitening for an extra-dazzling smile! Crown lengthening is not used solely for cosmetic reasons. When a tooth is injured and breaks at the gum line or if a filling or crown comes off a tooth that contains decay, crown lengthening makes additional tooth structure accessible for further restorative work. It is also used to treat some types of periodontal disease. At Szalai & Szalai DDS, we perform cosmetic and restorative crown lengthening for patients in the Allen Park, Dearborn and Taylor area. The surgery can be performed by a general dentist, periodontist or oral surgeon. If you are interested in crown lengthening or other cosmetic dental procedures and live in the Detroit, area, schedule an exam by calling 313-928-2323. We are conveniently located at 5329 Allen Road, in Allen Park, MI. When you come in, we can show you before and after photos of Michigan cosmetic dentistry clients who are enjoying their new smile.